Over 12 million Easter Lilies were grown and sold in the United States and Canada this year. An example of these flowers available for purchase are at the Proflower's page of Lilies. but soon the flowers fade and you are faced with the question of what to do with your plant. In the home, Easter Lilies prefer fairly cool daytime temperatures of 60-65 degrees F.
Night temperatures should be slightly cooler at 55-60 degrees. from appliances, fireplaces or heating ducts. Easter Lilies thrive in bright, indirect daylight, but the blossoms will quickly wilt and fade if they are placed in direct sunlight. Turn your lily every couple of days to prevent the stalk from 'leaning' toward the light. 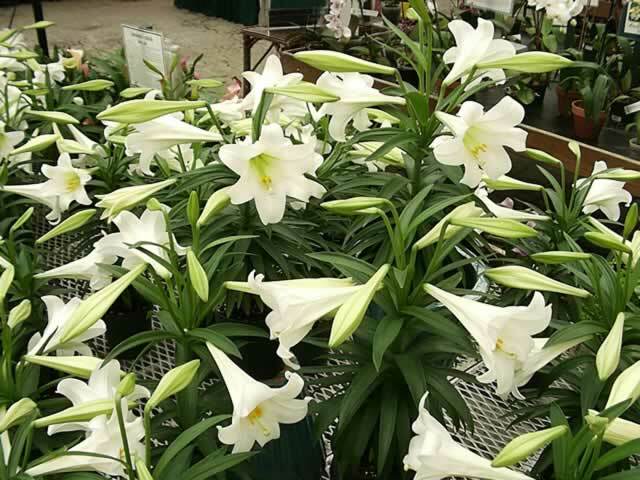 Easter Lilies prefer well-drained soil which is kept moderately moist, but avoid over-watering. Do not to let your plant sit in trapped, standing water! The foil or plastic sleeve that more than likely was used as a cover for the pot can become the cause of 'death by drowning' if it is left on the plant during watering. Be sure to remove the plant from the cover sleeve, then water it thoroughly until the soil is completely saturated. Once the excess water has drained from the planter, you can return it to the decorative cover. The unopened blossoms may fail if there is insufficient moisture in the air, so it is a good idea to set the pot on top of saucer filled with small stones and water, to provide extra humidity for your plant. Remove the faded flower heads promptly to prevent the plant from seeding, so that the plant's energy can be devoted to feeding the bulb for next years flowers. You can continue to grow your Easter Lily in your house after it has finished blooming but it is usually very difficult to force Easter lilies into bloom a second time when they are grown indoors. (This is usually sometime after May 15). Prepare a sunny location in the garden using a well draining commercial planting mix, or a mix of one part soil, one part peat moss and one part perlite. Set the entire pot and plant into the ground until the foliage has died back, then gently remove it from the pot and plant it directly into the ground. Spread the root ball by gently pulling upward and outward from the center to loosen the clumped and matted roots. Plant it a little deeper than what it was growing in the pot, with the bulb about three inches below the soil surface. Lily bulbs should be planted 6" deep and at least 12 to 18 inches apart in a deep enough hole that the bulbs can be placed in it with the roots spread out and down, as they naturally grow. Spread the roots and work the prepared soil in around the bulbs making certain that there are no air pockets around the roots. Water thoroughly after planting. Cover it with soil, mulch, and cut the stems back to the ground. Feed monthly with an all-purpose 10-10-10 water-soluble fertilizer. New shoots should begin to appear in a short time, and with any luck, your lily may bloom again in the late summer. Easter Lilies are considered hardy even in cold climates but many are killed off by exposure to winter winds and sun. Be sure to provide winter protection by mulching the ground with a thick, generous layer of straw, leaves, evergreen boughs, wood chips or pine needles. Carefully remove the mulch in the spring to allow new shoots to come up and scratch in a little 5-10-5 fertilizer following the manufacturers recommendations. Alternatively, you may also dig the bulbs in the fall and store them indoors for planting in the following spring, the same way we do other tender bulbs such as canna. Please keep in mind that your Easter Lily will not bloom in the garden in time for Easter next year. Their natural blooming period in the garden is in June or July! Easter Lilies are highly toxic to cats and other critters!!! !